Cretin, by Eric Kuns (1999). Ballpoint on paper. Done in one sitting. Blast from the past ballpoint drawing. Sometimes, rarely, I will sit down with a ballpoint pen and just start drawing. It’s a style I developed when I was a kid. My parents had custom ballpoints made for their business, so they were always around. I wasn’t receiving art training. I just drew monsters, robots/cyborgs, spaceships, lizards, aliens and caricatures of some of my teachers and other adults. The reason I mention I wasn’t getting any proper training is because this is not a standard or recommended approach to drawing. You should first sketch out the composition, then move from general to particular, in pencil (so you can erase). At a certain point you can switch to the more permanent ink. Ballpoint is also not considered an ideal drawing tool. I actually can’t think of anyone who is known for drawing with ballpoint. But, it has a lot of virtue if it’s the kind with the gooier ink. You can make really fine lines with it. My method was almost always to start by drawing an eye. The biggest drawback is you can’t make any conspicuous mistakes. You can only make small ones and figure out how to incorporate them. Now and again I revisit this style. I’m usually surprised I can still do it. The Cretin from about a decade ago. It was a sketch to be included in a larger image I never finished. I thought of this guy because I’ve been under the influence of the worst food poisoning, or flu I’ve ever had. I’ll spare the details, but I spent most of last night in an undesirable state between sleeping and waking that was the worst of both worlds. My stomach was constantly gurgling (which is enormously better than what it was doing the day and night before), and whenever my mind would begin to relax I’d see images. They’d evolve a bit and then disappear. They were uniformly Boschian (which is to say they were of the ilk of the paintings of Hieronymus Bosch). They were the sinister creatures of the nightmare imagination. Many were bleeding and retching profusely. Others were devouring hapless victims with excessive teeth or mandibles. But because it was the stuff of the imagination, it wasn’t really frightening. The disasters and misfortunes of the real world are more horrific. 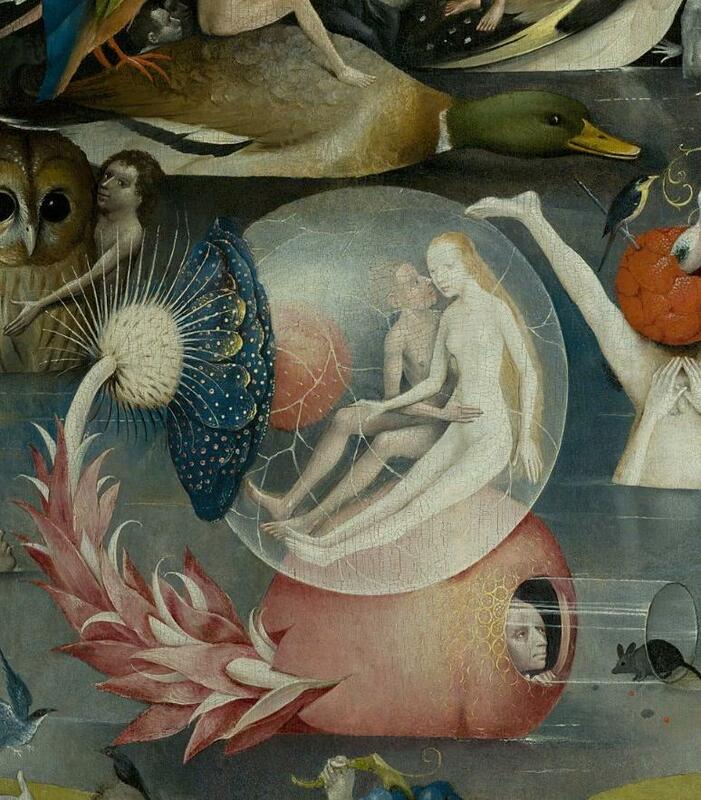 Hieronymus Bosch, “The Garden of Earthly Delights” 1490-1510. Even his “Earthly Delights” looks bizarre and uninviting to me. Hieronymus Bosch, “The Last Judgment” detail (after 1482). The depictions of hell are only more alarming in the details, but are no less weird. This was more like entering another dimension, and one which I think only visual art has claim to. For me Bosch is a bit of a cliche. He’s the type of artist you like when you’re in your teens, along with Dali. Bosch’s people seem no more real than puppets. Nevertheless, much of art in any media falls short of Bosch’s achievements, and he among others opened a vista in the imagination that is peculiarly suited to painting, and which other media may not be able to articulate. A contemporary artist who does precisely this kind of work, more than adequately filling the void left by Bosch, and dare I say fantastically, is Robert Steven Connett. Robert Steven Connett, “Bad Dreams” Acrylic on wood panel. 16″ x 16″ (012-13). If you’re looking for a modern day Bosch, look no further. In the interminable night I toyed with putting to (digital) canvas some of the images that kept cropping up. The beautiful, white, praying mantis with wavy fur eating the face off of a businessman. The caterpillar with the skulls head. I wouldn’t want to live in this repertoire, but I might pay it a visit now and again. For now, you have the decade-old cretin. He’s smiling, but the reason was that an alien was being executed. Posted in UncategorizedTagged ballpoint drawing, Cretin, drawing, flu, food poisoning, Hieronymus Bosch, ink drawing, monster, mutant, Robert Steven ConnettBookmark the permalink. How do you get those wispy lines with a ballpoint – no matter how gooey the ink? Surely you can’t be pressing hard enough to roll the ball. It works a lot better with the cheaper pens. I don’t like those pens for writing because I like a thicker line that’s easier to draw. But for drawing, those actually will let you make faint lines.I kind of do it by instinct at this point, but, I believe tilting the pen at an angle is the trick. Also I’m left handed and make characters from bottom to top, so… that could have a little to do with it.